The French have their onion soup, and we Slovaks have our garlic soup (cesnaková polievka or cesnačka). There are basically two kinds of this soup, the creamy garlic soup and the clear one shown in this recipe. This clear variety is much more common throughout Slovakia. I was eating it almost daily on my travels this past summer. Some restaurants make it really garlicky, sometimes to the point of not being edible. The way I made it, the soup had only a slight garlic taste. 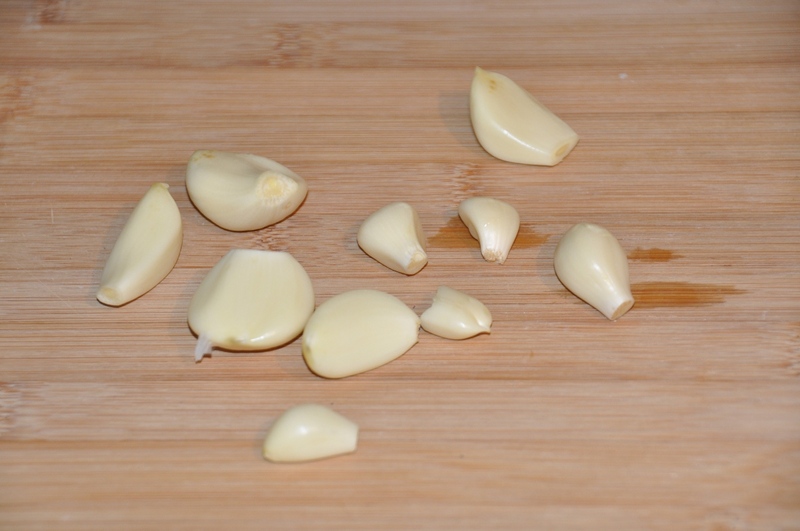 If you really like the taste of garlic, use a few more cloves of garlic. Peel the cloves of garlic (cesnak) and crush them using a garlic press. Alternatively you can chop them using a grater, or just slice them fine with a knife (this is what I did). 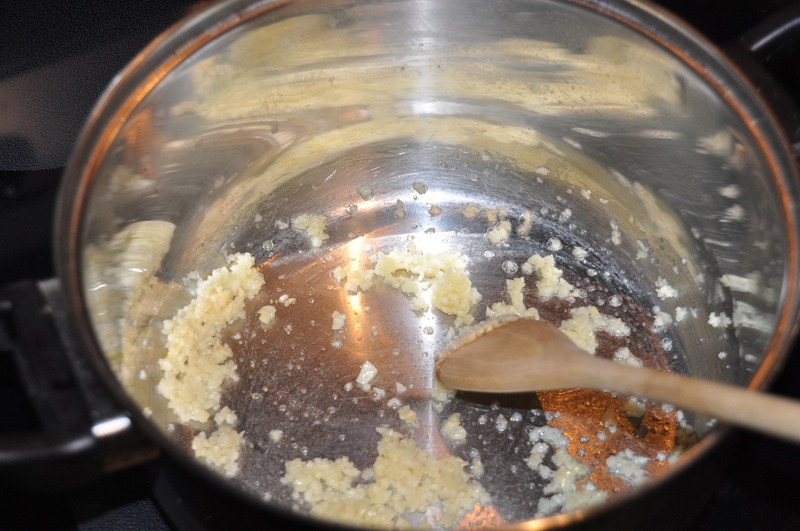 Melt two tablespoons of butter (maslo) in a pot and add the garlic. Fry for few seconds. Next add some eight cups of water (voda), 2 heaping teaspoons of paprika (mletá červená paprika), another teaspoon of caraway (rasca), and salt (soľ) to taste. 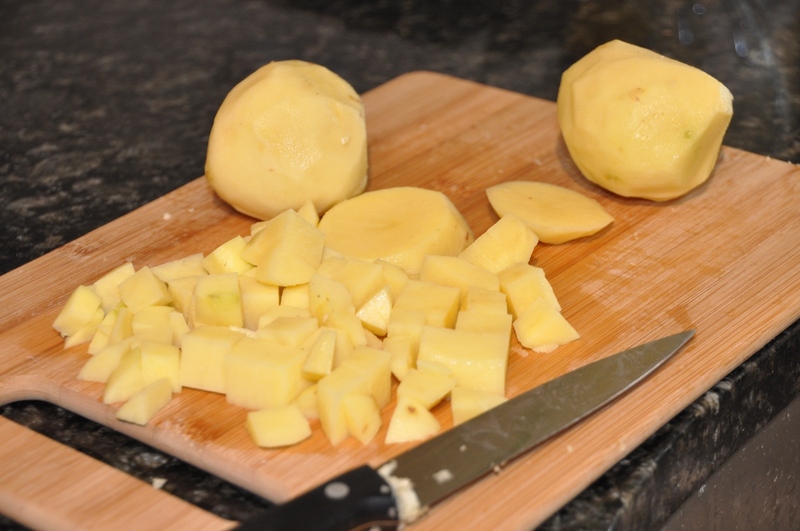 Then peel the potatoes, cut them into small cubes, and add to the pot. Boil for about 15 minutes until the potatoes get soft. 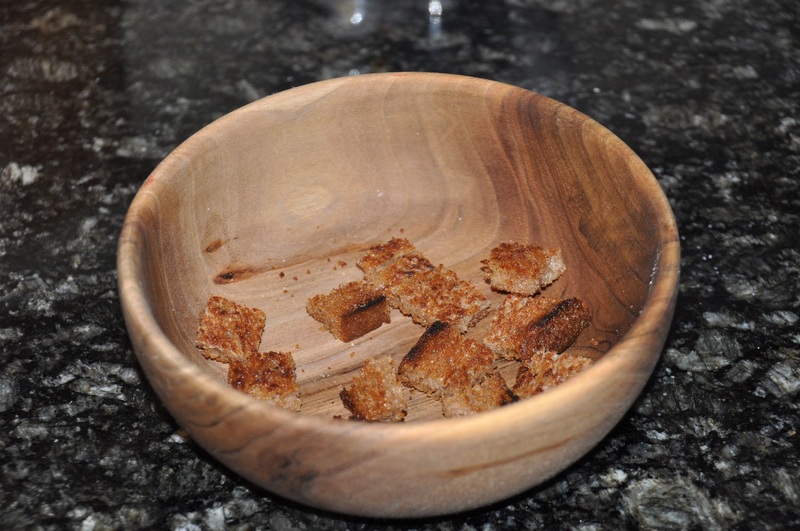 In the meantime, toast a slice of bread (chlieb). I toasted mine on butter in a frying pan but you could just use a toaster. Cut the toast into squares and put them in a bowl. 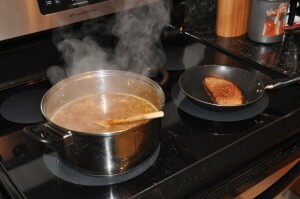 Then scoop the finished soup over the bread. Finally, grate some cheese into the soup (I used Swiss) and also decorate with some garnish, such as parsley (petržlenová vnať). Enjoy! Cesnacka moze byt vzdy a vsade. Ako vidim aj v Amerike:) Ja ju robim bez zemiacikov, ale nabuduce ich skusim pridat. Very good winter soup, very easy and HEALTHY. In pictures, you put water and then red paprika powder- you have to reverse this for a better results. Paprika has to go thru the intense heat for few seconds to release the flavors. Also, if you want to prepare the soup in a larger batch ( for a “seconds”), don’t put bread squares into the soup before you are ready to eat it- it will soak up the liquids and end up having a bread porridge instead. I usually use wide noodles instead of bread into the soup, but have a slice of that bread on the side. I love this soup. It’s popular (ludova-non medicinal) cold remedy. Both soups are simple,quick and very healthy. We called them a “poor man soup”. You’re doing a great job creating this step-by-step cooking instructions, my daughter and her husband will appreciate it long after I’m gone. heck, making it tonight … I need some “comfort” meal. Potatoes are the must, they take the edge from garlic taste. I love it!! I made this soup for lunch, and my husband said it was easily one of the best soups he has ever had! I added some spicy sausage and used croutons instead of the bread and it was awesome! Thanks for posting this recipe. Cant wait to make it again. That’s awesome, Nikkey. Plus it is so easy to make. I appreciate this website, I love the garlic soup my grandmother used to prepare it-thank you for the recipe. 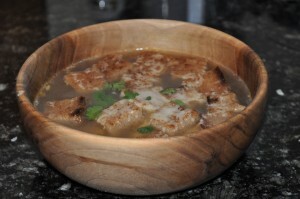 In one restaurant in Bratislava the garlic soup was served in a round brown bread(the proper Slovak one) . They cut the top off, took some of the inside out and dumped some tore pieces of bread back in the soup. It looked fantastic and it was delicious (that’s if you like soggy bread). Katarina, I found a picture of soup in the bread. One is the lentil and the second is about chicken soup with noodles. That method is suitable for serving a loaf of bread. Sound great. Esp the lentil soup. again, this is not exactly a Slovak specialty, it’s a typical French cuisine, serving a hearty soups in a round loaf of bread. French onion soup would not be served any other way. And yes, a Slovak cuisine adjusted, though it’s still just in some specialty restaurants, not a typical Slovak food. Everytime i make mashed potatoes i reserve the liquid and few potatoes. In a bowl combine garlic,oil,paprika and dash of black pepper ad the liquid with potatoes. I aslo ad some chicken bouillon or “Vegeta” it is European soup mix seasoning. You get soup and mashed potatoes from one pot. I’m home with a cold today and just made this soup. I think I’m feeling better already! 🙂 Tastes just like the soups I had when travelling through Slovakia. Vďaka všetkým mojim rodákom za recepty a velikánska prosba: môže mi ktosi poradiť, ako najlepšie napodobniť (nemyslím, že je to možné ju v USA vyrobiť)SLOVENSKÚ BRYNDZU? If you have a food processor then try this : One or two blocks of Cream cheese and Greek Feta cheese processed until it’s nicely smooth. You can also add finelly shredded Jack cheese to add some texture to it, not too much. Then enjoy on good German bread or Costco bread that you can heat in the oven for extra crispy. Enjoy and let me know if you liked this bryndza substitute. I have a book with warious bryndz recipes. Let me know if you liked this and I will send you copy of the book. How can I obtain a book of your bryndza recipes? Dakujem Domi. Ale tak ste aspon blizsie ku slovenskym komunitam. V New Jersey a v New Yorku je o mnoho viac Slovakov nez tu v D.C.
Soup came out lovely…I used un chicken broth cubes(from Edwards and Sons) to doll it up with a little more flavor; otherwise a tad watery (I liked it that way too; but my man not as much) …I also dolled it up even mo’ with gluten free, diary free breadcrumbs that had same ingredients, but with a pinch of rosemary…I added shredded swiss on one and parmasean in another ….I think toasted Jewish rye would be another option instead of croutons…now I am going to try the other garlic soup too! I am INSPIRED!!! how many servings does this exact recipe yield? This soup looks great and I have had similar versions during trips to Slovakia. However sometimes the garlic soup served is white in color, could this be just the addition of milk/cream or is there something else? Soup is probably the cream, use an immersion blender. Thank you Josephine. While this is interesting and I like the idea of a thicker, creamier soup, the white version to which I referred was thin, broth-like. I assume it is just the addition of milk/cream but was looking for verification. 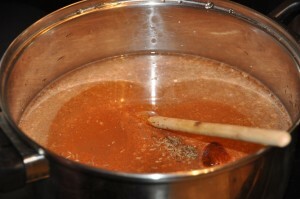 Then it is a common roux. Oil to fry the flour, quenched with water and stirred into the soup. Made this soup but did not have all the ingredients: Only had 2 russet potatoes so I added in 2 eggs as well and supplemented marjoram for caraway. Also, I added 1 (14.5 ounce) can no salt added petite diced tomatoes since my sister adores tomato in soups. We ate it with simple buttered toast. It was delicious. The best thing about this soup is that the longer it sits the better is tastes so it is impossible to tire of it easily even if you eat it for 2 or 3 days! Next time, I will definitely have 4 potatoes on hand, as the soup seemed to be a little watery without them. Great soup! Thank you for the recipe. Please could you advise, when you say caraway, is this added as a seed or a spice (powder) ? Thank you. Nice. I used some veg stock and Marmite for flavour, and just a dash of salt, also some cumin as I didn’t have caraway. Cathedral city is a winner for the cheese! I made this today because I am in the midst of a full blown respiratory scourge and already feel better! So simple and so good!